We have been paying bills and accepting payments with QChex since May 2003, and have been very impressed with this new system. Naturally, we were skeptical at first at the idea of sending a check via email. But we have found Qchex to be easy, fast, and secure. It saves us the fees that credit card companies charge, so we pass the savings on to you. Enter your address as it appears on your check. 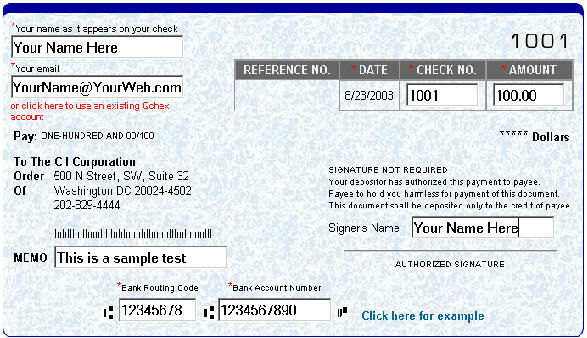 Enter your bank name and address as it appears on your check. uncheck the "User the address verification system"
NOTE: We are not the QChex company. We just like their service and recommend them. Please do not call us for tech support to how to reach them. just click here to sign up for your own account. We predict that in the future, email based checks will become the norm. It is similar to the idea of a "check by phone" only in written form. Please feel free to email or call us with any questions on how it works. "The check's in the eMail!"